When you look at Glenn Gould in this film or in a photograph, you notice that he had a slightly off-kilter facial structure: his right ear protruded outwardly, making his appearance uniquely odd. But how appropriate that face, that overall appearance was to his quaint – no, bizarre – and profoundly complex personality. Whatever you might say about him – that he was an eccentric genius, an eccentric phoney, an eccentric virtuoso – he was, in the end, an eccentric talent of the rarest order. This film almost succeeds in drawing more attention to his eccentricity than to his genius. That's understandable, since Gould's quaint manner of playing, his odd commentary and opinions, his odd lifestyle, and his odd habits and personal needs were tasty food for a tabloid approach to examining his life and artistry. The film's director here, Bruno Monsaingeon, to his credit, avoids the tabloid potential Gould offered, but succumbs, at least to a noticeable degree, to an occasional fixation on the pianist's goofiness and eccentricity. Yes, we learn about his childhood, about his views on life, spirituality and music, and about what infused his artistry. But much of the time we have-suspect that Gould himself, in his copious commentary, presents views and anecdotes with a tongue-in-cheek manner, almost as if he's going out of his way to appear odd or intellectually distinctive to foster some clever deception. But all this mystery seems to be part of his complex personality. Are we being had? I don't know, but the fellow is tremendously intelligent and talented. And his legend grows. Van Cliburn was a contemporary of Gould, one who vastly overshadowed him in the late-1950s and 1960s. But who is better-remembered today? Who, in the end, was more influential? Gould's Bach interpretations alone comprise an artistic legacy that outweighs the complete work of almost any pianist of his time. 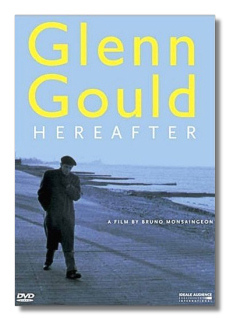 Monsaingeon made seven films about Glenn Gould and distilled this effort from them and apparently other sources to give a broad perspective on the artist and his life. Despite my reservations, I can say that he succeeded handsomely. Gould's opinions alone are almost priceless. He explains his reasons for withdrawing from live-concert performance in a civilized argument with Yehudi Menuhin, then later states he hates audiences, that collectively… "audiences are a force of evil". He reveals his favorite composers – Bach, not surprisingly, tops the list. The most overrated 20th century composers, to him, were Bartók and Stravinsky! But you get so much else here: Gould sings as he plays; he slumps at the keyboard so low, you wonder how he can play; he often narrates as he plays; and sometimes he just plays – Bach, Brahms, Prokofieff, Mozart, Beethoven, Orlando Gibbons, Hindemith, Schoenberg and many others. This is a smorgasbord of Gouldian delight! The pianist's fans will need no prodding to purchase this DVD. Fans of 20th-Century keyboard giants and of 20th-Century musicians in general will want this documentary film not just for its amusements, but for the insights and artistry.